Australian scientists are working to classify a new species of giant jellyfish that washed up on a beach in Tasmania. 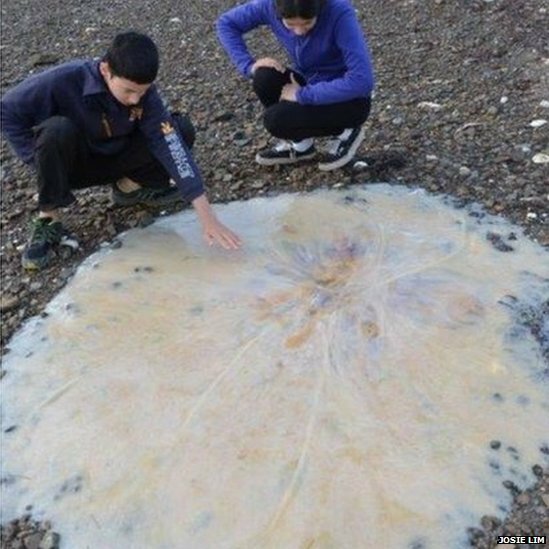 A family found the 5ft jellyfish on a beach south of Hobart last month. Dr. Lisa-ann Gershwin, of Australia’s CSIRO government agency, said that scientists had known about the species for a while but had not yet classified it. She described the specimen as a “truly magnificent animal”. Experts at the Commonwealth Scientific and Industrial Research Organization (CSIRO) were alerted to the discovery by Josie Lim and her family, who came across it. “She and her children found the jellyfish and took this amazing photo that just boggles the mind,” jellyfish expert Dr. Lisa-ann Gershwin said. This species was part of the Lion’s Mane group, she said. These jellyfish “look like a dinner plate with a mop hanging underneath – they have a really raggedy look to them”, she said. The Tasmanian discovery was found stranded belly-up, Dr. Lisa-ann Gershwin explained. It was one of a “species I’ve known about for a while but it’s not yet named and classified”, she said. It is one of three new species of Lion’s Mane in Tasmania which the scientist is currently working to classify. Recent years had seen “huge blooms” of jellyfish in Tasmanian waters, she said, but scientists were not sure why. “We’re very keen to find out why jellyfish are blooming in such super-abundances in these southern waters,” she said. The world’s largest jellyfish shares the same genus – Cyanea – as the Lion’s Mane. Found in the North Atlantic and Arctic, the Cyanea Arctica can grow up to 10ft across the body, Dr. Lisa-ann Gershwin said.